We've moved our blog to Wordpress as it gives the opportunity for a prettier experience (in my opinion). We really hope you'll still visit us over there. 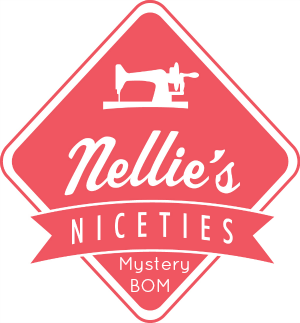 It's still a bit of a work in progress but it should be a lot easier to find all of our free patterns and templates over there. We've moved all of the content from this blog so with time we're hoping it will be somewhere you'll enjoy visiting. Please re-add us to your Bloglovin' and Feedly accounts or consider signing up to receive emails when we post on the new blog. Thank you all for your support here over the years we hope this won't be the end of our little community. I love the effect that they give. 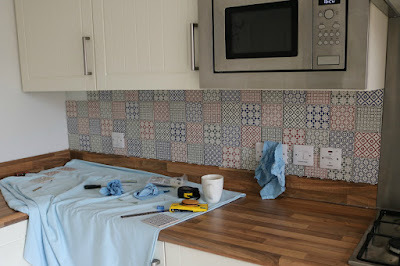 I think they're a good mix of traditional and modern style and they represent my patchwork madness that dominates the rest of the house but was a bit lacking in the kitchen until now. The kitchen feels very homely with this little infusion of colour. 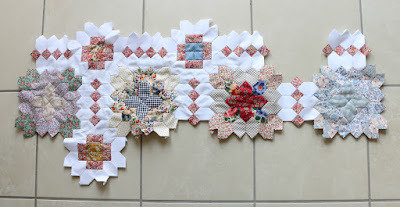 I'll get a better picture when hubby has finished the grouting...As it just wouldn't be right to finish a blog post without something fabric-y I thought I'd share my progress so far on the Patchwork of the Crosses BOM. 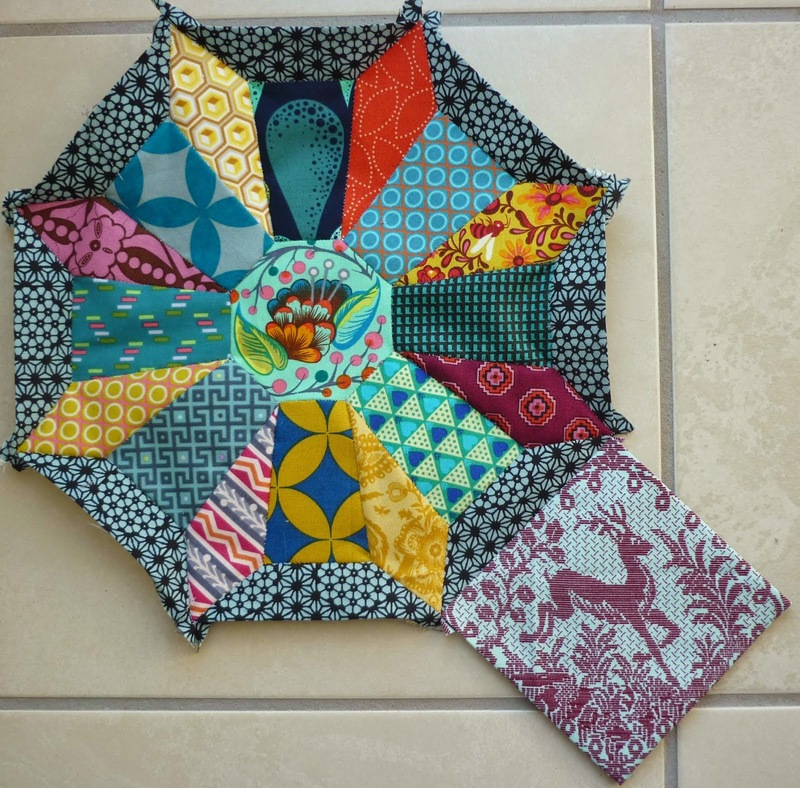 Jessie Fincham of Sew and Quilt is running this gorgeous Liberty fabric BOM and while the fabrics and colours are not really me I suspect there is a teenager not too far from here who will love this when it's finished. I'm running slightly behind as I'm fairly certain month 4 won't be far off but as I'm stitching the blocks together as I make them I'm using that as my excuse. 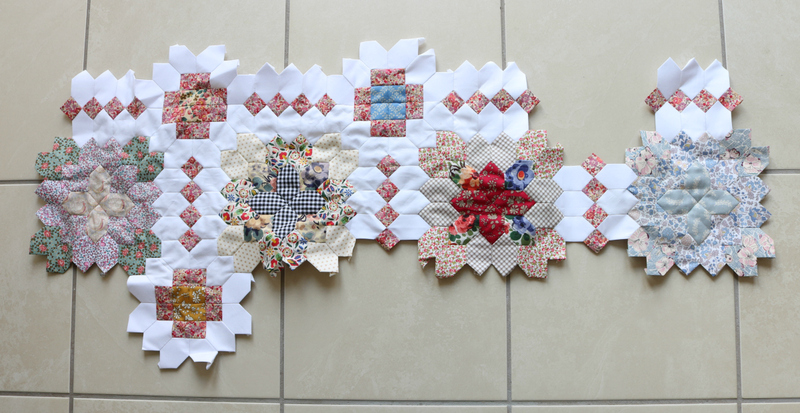 I just know that if I left all the joining to the end of the 12 months BOM the quilt top would never be finished. It's quite nice to just stitch something without having to make any design decisions for a change. I had happy mail today. My subscription copy of Love Patchwork & Quilting issue 33 arrived and this month there is a little project by yours truly in it. I had the great pleasure of working with Lecien's new 1000 colours solids range. The colours are beautifully saturated and really pop against a white background. Here's the professional shot from inside the magazine. It's a simple tumbling blocks design but the placement of colours makes it look a bit more complicated.I used a variegated Aurifil thread to straight line quilt a star design over the pieced section of the wall hanging to add a bit of texture. This is what it looks like from the back of the wall hanging. 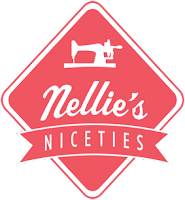 I have been working hard for months behind the scenes preparing for the launch of our new online shop on the Nellie's Niceties website. 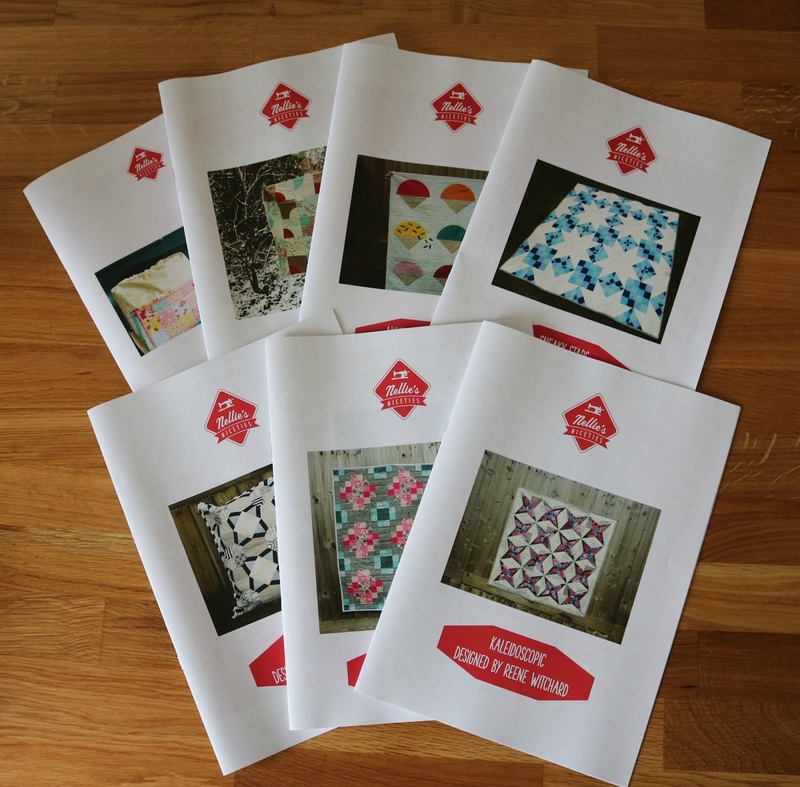 I'm ridiculously excited to share that I have had seven of the patterns professionally printed in A4 booklet form. I think it's really nice to be able to hold a pattern every once in a while rather than having to scroll through it on a screen. 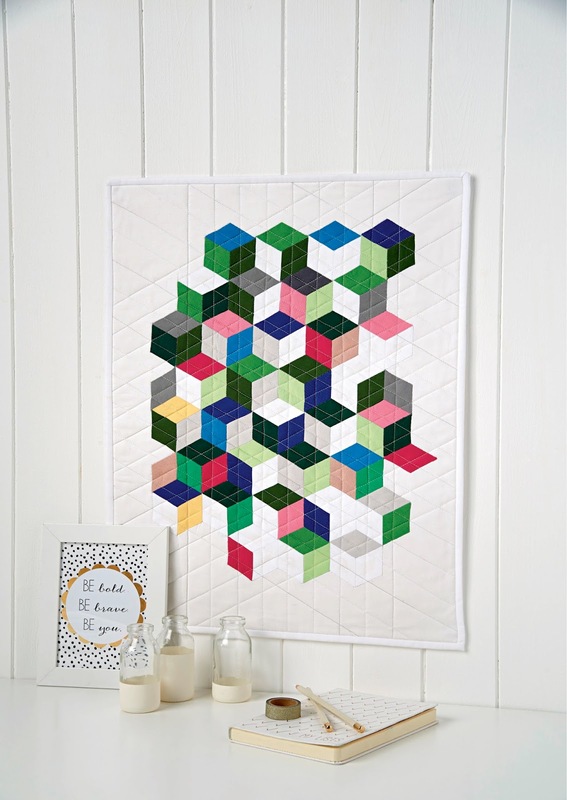 Kaleidoscopic - full instructions and templates for a foundation pieced quilt, suitable for all abilities. Granny Crosses - full instructions for strip pieced quilt and cushion, suitable for all abilities. 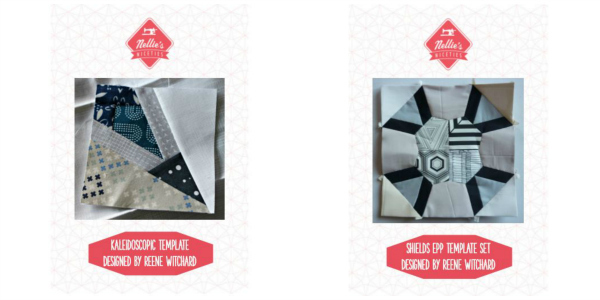 Shields EPP - full instructions and templates for EPP cushion, suitable for all abilities. 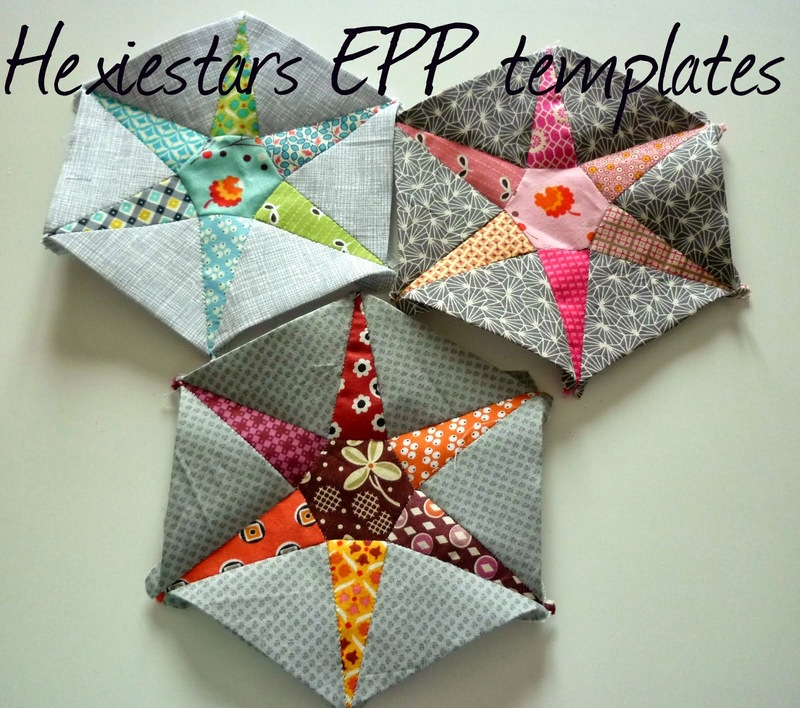 Sneaky Stars - full instructions for lap size and cot size quilts, suitable for all abilities. Anyone for ice cream - full instructions and templates for lap size quilt, suitable for all abilities. 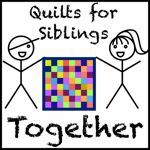 Candy Twists - full instructions and templates for lap size quilt, suitable for all abilities. 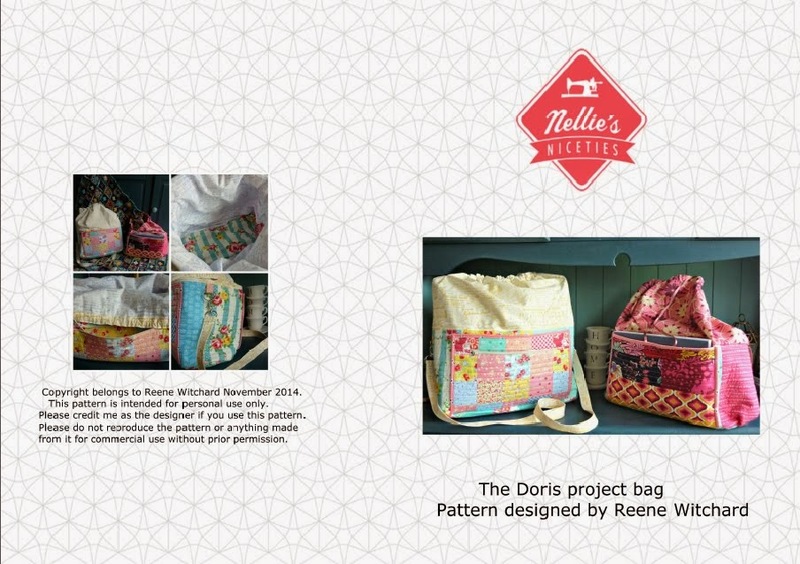 Doris Project bag - full instructions for fully lined drawstring project bag with options for pockets and straps. 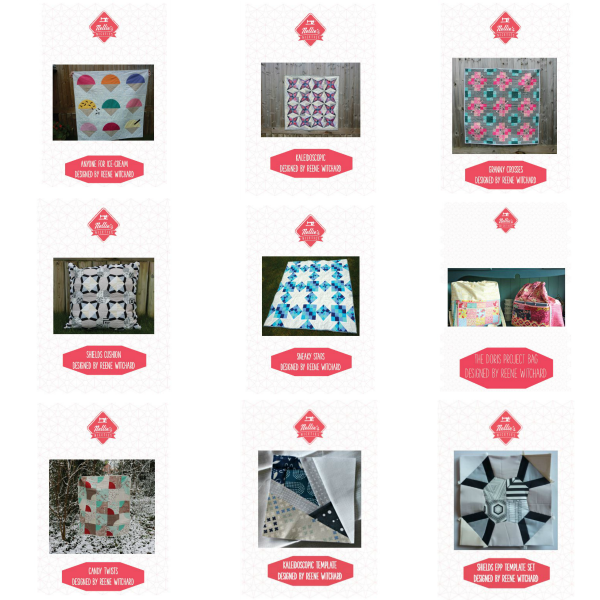 Kaleidoscopic template set - Kaleidoscopic template and colouring sheet with no written instruction, suitable for people with experience of foundation piecing. Shields EPP template set - Shields EPP template sheet and colouring sheet with no written instruction, suitable for people with experience of EPP. 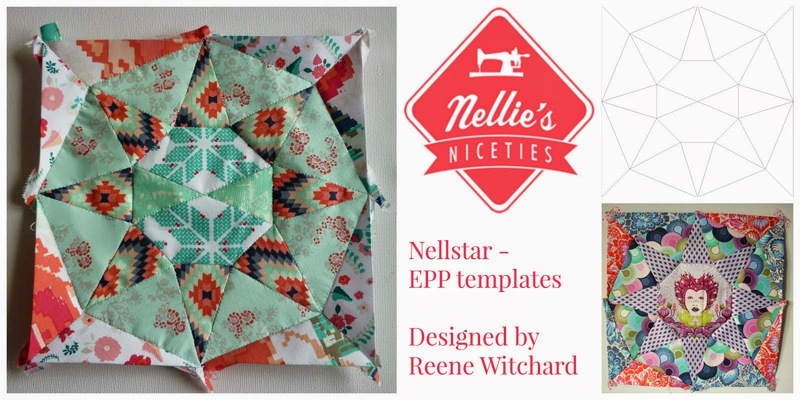 More information on each of the patterns can be found on the relevant product listing page. You will also be able to purchase Jess' Rose Blackout range of note cards in our new website store and Jess is hoping to increase her range later in the year. To celebrate the launch of our website store we are offering a 20% discount until the end of March. Use code LAUNCH20 in any of our stores for 20% off everything. We really hope you'll like the look of our new store and we'd love to hear any constructive feedback. Please bear with us if there are any hiccups in the early stages of the launch. Friday 11th - Sunday 13th November 2016. 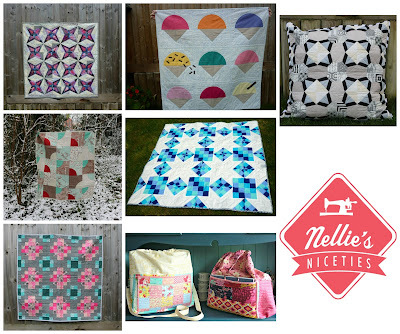 I've lost my final marble and taken a stand for Nellie's Niceties at the West Country Quilt and Textile Show. .. that I don't possess but thankfully Sarah does. About 6 months ago I held a giveaway over on Instagram and Sarah was the winner. The prize was a custom cushion made by yours truly. Sarah highlighted some of my designs that she liked and then left me to get on with it. Sarah was particularly fond of two of my quilts, Never Forgotten and Kaleidoscopic, so I figured I'd make something that included elements of both of them. 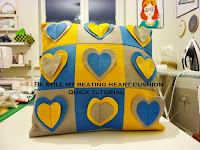 What I forgot was that improv is not a speedy process for me, hence this cushion being 6 months in the making. 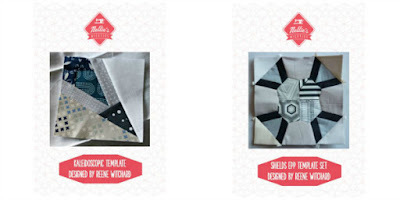 I started by making a Hexiestars block with fabrics left over from my Kaleidoscopic quilt and built random blocks out from there. I had to walk away from it at my first attempt as I just didn't know how I wanted it to develop. Yesterday I picked it back up after a long absence and once I got into my stride it didn't take long at all to finish it up. 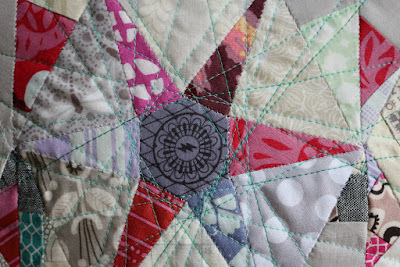 I crazy straight line quilted with a variegated green Aurifil thread which melted into the background beautifully. Well my plans for regular blogging really haven't gone all that well. 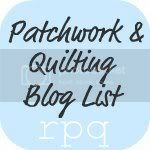 I have been busy sewing and sharing progress on Instagram but that hasn't translated into blog posts. To those of you who still frequent these parts I'm sorry that you've been neglected. I will try harder, honestly. I stepped in as an "Angel" for the Pillow Talk Swap Instagram edition so I've had a few fun days stitching up this cushion. 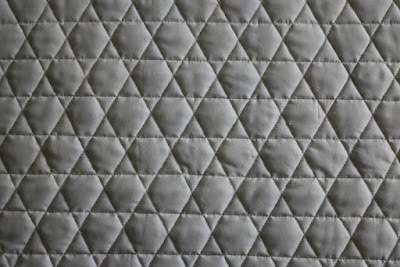 I resized the templates from my Kaleidoscopic quilt to create this 18" square cushion. 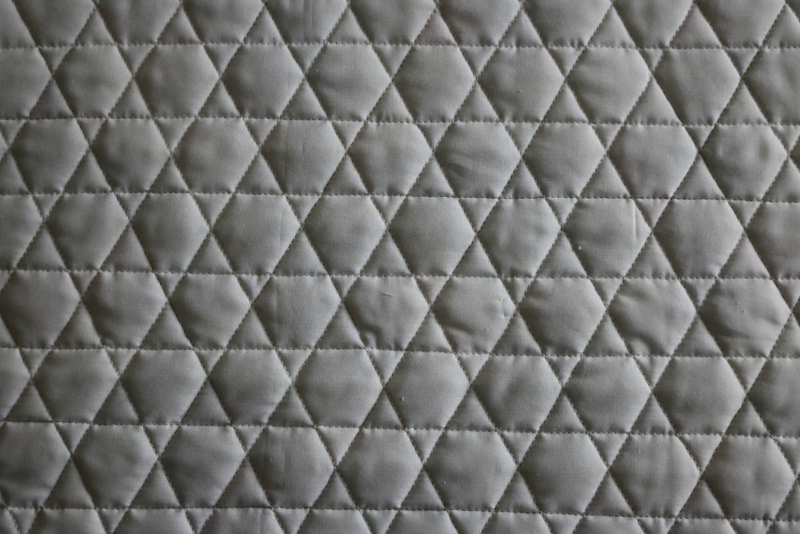 I used Aurifil to echo quilt in the diamonds for a subtle look, there was already plenty going on with all the different fabrics. It was slightly painful sending this one off today, I really hope it will be loved by the recipient. 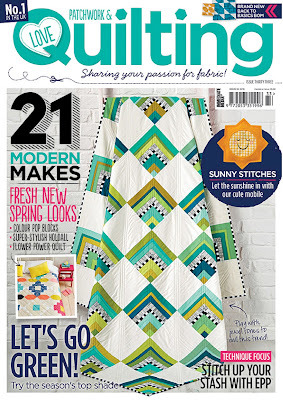 I couldn't resist taking a shot of it with the original Kaleidoscopic quilt.